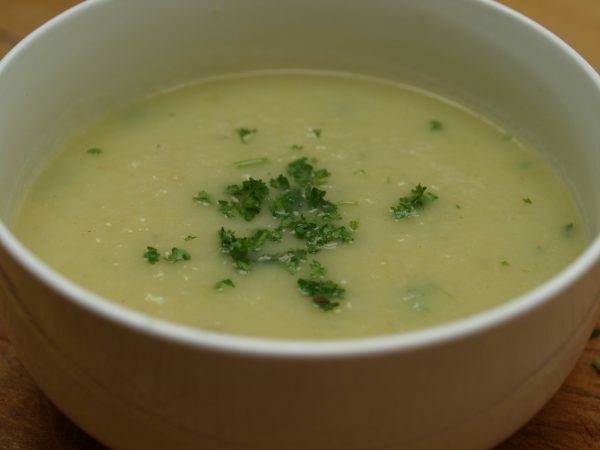 This soup is a British classic offering a deliciously tasty warm bowl of goodness thickened naturally with potatoes a carbohydrate which also fills you up. Heat the oil or oil and butter in a large saucepan. Gently cook the onion and celery, till soft but without colour approx 1 – 2 minutes. Add the garlic and leeks, cooking for 3 – 4 minutes. Add the potatoes and pour on the stock or milk. Cover with a lid, only if you have one that fits, simmer for 20 minutes or until the potatoes are tender. Liquidize / blend till smooth –ish. Season to taste, sprinkle in the herbs and serve. If you like your soup thinner add a little water, stock, cream or milk. Tip – Make this soup your own by replacing the leek with any vegetable you like – try broccoli, spring greens, cauliflower, carrots or courgettes. You can also enrich soup with cheese try replacing the leeks with broccoli and then melting in 60 g of stilton at the end making Broccoli and Stilton soup or finish of with a heaped teaspoon of cream fraiche each.